Recognising that child protection assessment is a complex, ongoing and dynamic process that is most effective when undertaken in partnership with families and their identified networks, PFS utilises a comprehensive collaborative assessment and planning framework adapted from the Signs of Safety assessment and planning protocol and the Massachusetts safety mapping framework. This process involves having all the key stakeholders who are involved with a child work together in gathering and analysing relevant information into key child protection domains, helping to move the assessment process from something that happens “to” families to something that happens “with” families. The CAP framework offers a common language to help gather and analyse case information, increasing clarity about what has gone on in the past that is concerning, what has happened or is happening in the present to keep the child safe, and what needs to occur going forward to move toward enduring safety for the child. It also makes use of scaling questions to help children, families and workers be clear about their own judgement and what steps are needed to move the case forward. See Turnell and Edwards (1999), Turnell & Parker (2009), and Chin, Decter, Madsen and Vogel (2010). Developed in New Zealand by Nicki Weld and Maggie Greening, the ‘Three Houses’ is a simple yet powerful tool designed to help child protection workers include the voices of children, young people and families in all aspects of the child protection process. 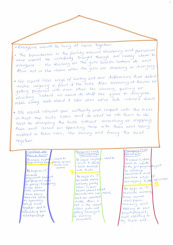 Within PFS, a simplified version of the ‘Three Houses’ tool is used to help workers understand children’s and young people’s views about what is happening in their lives and to help children and young people participate in the assessment and planning process. Gaining parents’/caregivers’ and family members’ views can be a difficult task for child protection professionals, particularly when family members may be angry or scared, may have little trust in professionals and may feel anxious about the possible consequences of speaking openly. 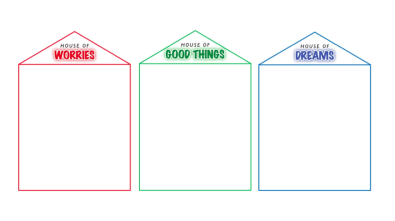 Developed in Australia by Sonja Parker, the ‘Future House’ is a visual tool that is designed to help child protection professionals elicit parents’ and family members’ ideas and visions about what actions are needed to build safety for the children. Eliciting the parents’/caregivers’ safety goals is a necessary first step in working with families to develop a joint vision (between caregivers, children, their safety network and child protection professionals) of enduring safety for the children. 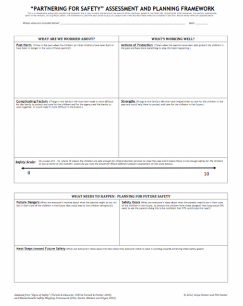 The ‘Safety House’ is a practical, visual tool, developed by Sonja Parker in Western Australia, that is designed to include children in the safety planning process and specifically to elicit their views on what would need to happen within their family to ensure that they are safe. Through this process, children are able to offer very detailed ideas from their perspective about what actions would need to occur to help them feel safer in their homes and which adults are best able to support that. Children in out-of-home care or involved with the child protection system frequently have little or no understanding as to how or why they are in care or even why child protection professionals are involved with their family. Developed in the UK by Susie Essex, John Gumbleton and Colin Luger (as part of the Resolutions Approach to working with ‘denied’ child abuse), the ‘Words and Pictures’ method provides a developmentally appropriate process and explanation to help children understand what has happened in their family that has led to the current situation. In a words and pictures process, family members and professionals work together to co-construct a storyboard to describe the sometimes difficult information about what has happened in a family’s life and what the family is now trying to do to respond. 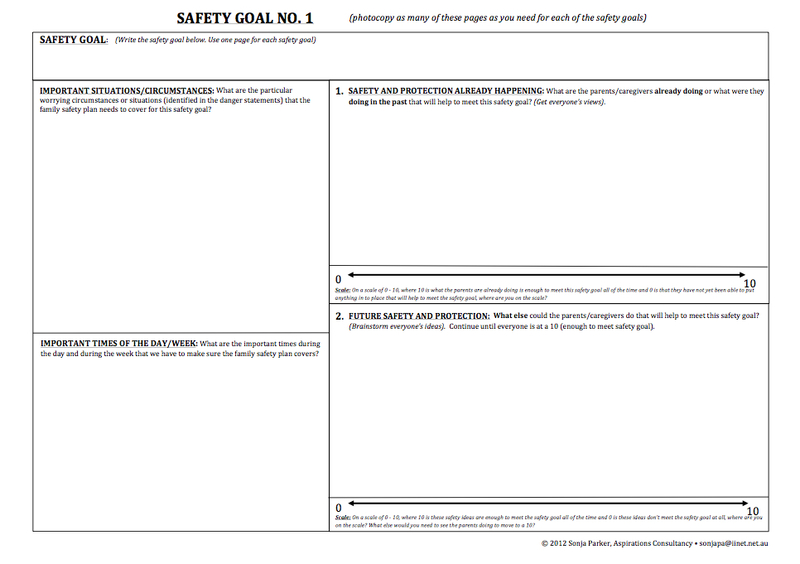 Within the “Partnering for Safety” approach, this storyboarding process is also used as part of safety planning to help children, family members, their identified network and other professionals understand what has happened that led to child protection involvement with the family. A critical component of the “Partnering for Safety” approach is the identification, development and involvement of a safety and support network for the children; a concept that was developed within the Resolutions Approach. This network is made up of family, friends and professionals who care about the children and family and who are willing to work with the family and with child protection professionals to develop, implement and monitor an ongoing safety plan. 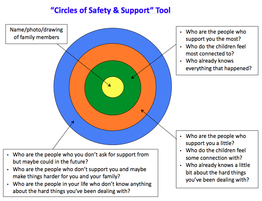 The ‘Circles of Safety and Support’ tool, inspired by the concentric circles used by Susie Essex in the ‘Words & Pictures’ method and the circles concept from the protective behaviours approach, was designed by Sonja Parker from Western Australia to help family members identify people for the family's safety and support network. This tool also helps child protection professionals to have conversations with family members about why a safety and support network is necessary, about the role of the safety and support network and the process of assessing who would be the most appropriate people to participate in this network. The “Family Roadmap” process is a dynamic, participatory and collaborative child protection assessment and planning process that has been designed to elicit the views and ideas of family members (and their safety network) in preparation for the family’s participation in the development of comprehensive safety plans. This collaborative assessment process creates a platform of shared understanding that is necessary for professionals and families to then be able to work together to develop effective safety plans for children. The “Family Roadmap” is created on a wall, a large table or on the floor: what’s important is that everyone can see everything that is being recorded in the ‘roadmap’ so that they have the greatest possible opportunity to participate in the process. This high level of participation is the other key characteristic of the “Family Roadmap” process, as family members are actively involved in writing and creating the ‘roadmap’. 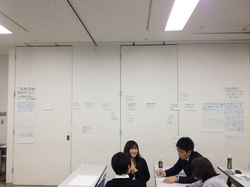 Creating a 'family roadmap' in Japan. 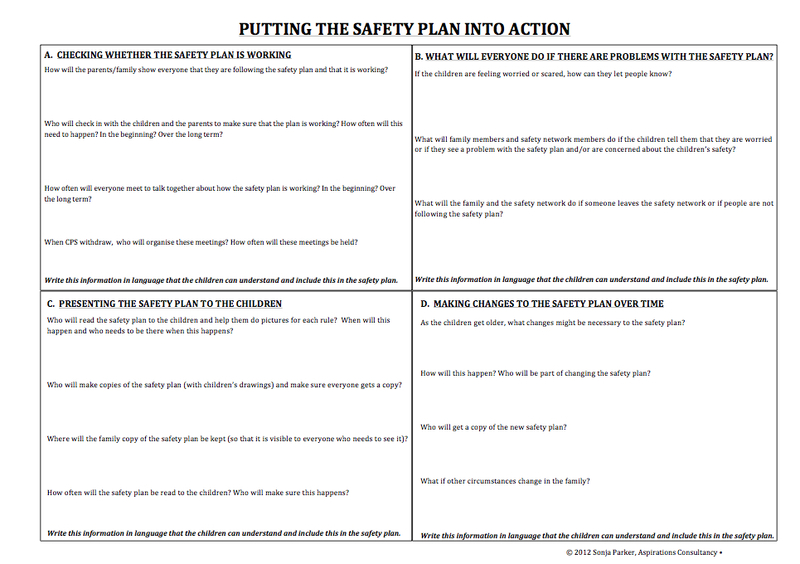 Safety planning is a complex process that involves all the significant people in a child’s life working together to develop a detailed safety plan. This family safety plan is one that will describe the day-to-day arrangements that a family and their safety network have agreed to put into place to ensure that the child will be safe in the future in relation to the identified dangers or worries. This process also involves monitoring and reviewing the safety plan over time, so that everyone is satisfied that the plan is working and will continue to work even once child protection withdraws. Developing these kinds of safety plans usually involves multiple meetings - first with the parents/caregivers, then with the children (if they are old enough) and the safety network. 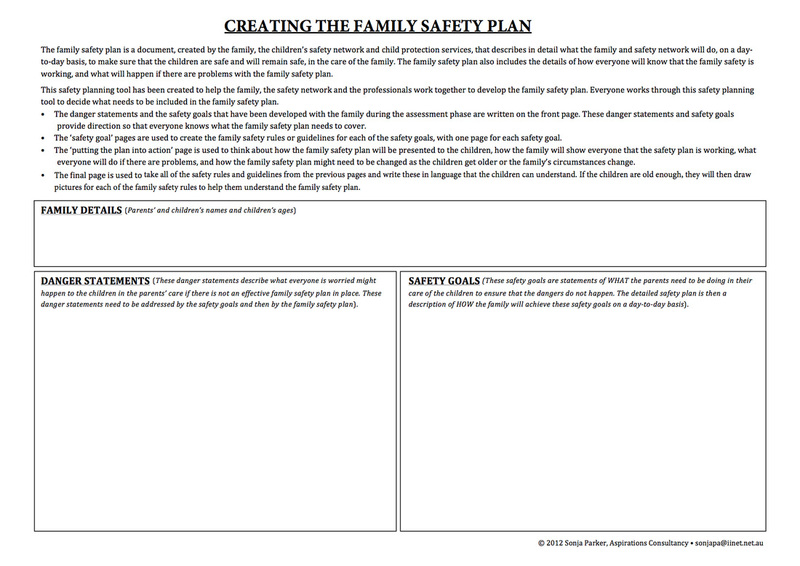 I developed this safety planning tool to help provide direction and focus for these family safety meetings and for the creation of these detailed safety plans. Appreciative Inquiry (AI) is an approach to organizational change developed by David Cooperrider at Case Western University in the US that draws on a core belief very closely related to Solution-Focused practice: That what we pay the most attention to has the best chance of growing. Appreciative Inquiry is a core component of the "Partnering for Safety' approach* and is used within the case mapping process, in supervision, case consultation and as part of coaching and mentoring to elicit and amplify examples of good practice. AI involves taking time within our teams and organizations to notice and then ask questions about the skills, knowledge and high-point moments of people’s work. It is a counter-practice to the fear, blame, and defensiveness that can characterize child protection work. As a process, it can help solidify new ways of working within an organization and assist individuals in recognizing their own skills and solutions to difficult problems. * Our use of AI has been significantly influenced by the work of Andrew Turnell in utilizing AI within the child protection context. The approach to implementation utilised within the "Partnering for Safety" approach is one that moves quickly from “stand and deliver” trainings to in-office practice, coaching and mentorship. Research on transference of learning in child protection shows that even multiple trainings done by dynamic and exciting trainers will not result in sustained behavior change over time. While the foundational practices of the Partnering for Safety approach are best introduced in a training, most of the skill development that needs to take place for successful uptake of these practices requires ongoing workplace coaching, identifying groups of people most likely to be able to spread the practice (‘early adopters’), and applying the practice within multiple settings such as case consultation and supervision. Each of these strategies is discussed briefly below. ‘Early adopters’ are members of the workforce who are likely to be the most excited about receiving training and coaching. They are staff within the organization often held in some esteem by their peers, and potentially could be people who could become trainers, coaches or leaders themselves in the future. This approach to implementation strongly suggests that these ‘early adopters’ be identified and provided extra support throughout the implementation process. As “pioneers” in a way, they become the initial staff members who go deep into the practice and then are responsible for “coming back”, being visible in the organization, telling stories about their work and diffusing the practice throughout the organization. Ultimately, it is these ‘early adopters’ who often become the biggest champions of the practice and have the biggest influence on their peers. The Partnering for Safety assessment and planning framework can be used as an organising framework for case consultation and supervision in order to support ongoing learning and skill development. This enhanced case consultation process is a facilitated process, lead by a supervisor, experienced practitioner or coach who uses the framework to help workers think critically about the family and their work with them. This process helps workers to develop and refine their assessment and casework skills while more fully embedding the approach into their ongoing work. Similarly, the framework can be used in a group supervision context, helping workers and units to develop a culture of transparency, openness and shared learning within the group. In particularly complex cases, this group supervision process can also create a sense of shared ownership for the work.